Several road closures are planned for July 4-7, and will affect motorists heading to popular holiday destinations such as the Queen Mary, the Carnival Cruise terminal and nearby waterfront hotels and restaurants. The four-day closure is needed so crews can demolish an overpass as part of construction of the new Gerald Desmond Bridge. Southbound Harbor Scenic Drive, one of the main roads from the southbound 710 freeway to the Queen Mary and nearby hotels and restaurants. Eastbound Ocean Boulevard, leaving San Pedro and Terminal Island heading into downtown Long Beach. The current detour for this route will be temporarily closed at the on-ramp from Pico Avenue at Pier E.
Westbound Ocean Boulevard, leaving downtown Long Beach heading toward San Pedro. This route will be closed at Golden Shore. Motorists heading on the southbound 710 for the Queen Mary for the 4th of July fireworks show are advised to take the “Port of Long Beach/Queen Mary” exit and follow detour signs. From July 5-7, the other detour route to the Queen Mary from the southbound 710 will be to take the “Downtown Long Beach, Convention Center, Aquarium” exit, then to Shoreline Drive. From Shoreline, turn right onto Queens Way and follow the signs to the Queen Mary. If traveling eastbound on Ocean from the Terminal Island area, vehicles headed to the Queen Mary will exit the Pico Avenue south off-ramp, turn right, proceed down Pico Avenue until a left‑turn on-ramp onto South Harbor Scenic Drive, then follow the signs to the Queen Mary. Motorists headed into downtown Long Beach from eastbound Ocean are advised to turn left at the Pico / 710 north off-ramp, head north, turn right onto 9th Street, continue onto 10th Street, then take the downtown on-ramp onto Shoreline Drive. Another alternate is to continue north via Pico, make a left turn onto the 710 on-ramp at Ninth Street, then travel up to Anaheim Street, making a right turn to head east into the city. Motorists traveling west on Ocean Boulevard toward San Pedro will be diverted north onto Golden Shore, which connects to the northbound 710 freeway. Travelers heading to Terminal Island and San Pedro can then exit at Anaheim Street and follow “Port of Long Beach” signs to turn left on Pico Avenue. After about one-quarter of a mile, motorists can reconnect with westbound Ocean. The closure is scheduled to end at noon on July 7. During this closure, crews will demolish the former connector ramp that took eastbound traffic from Terminal Island to the northbound 710 freeway. The ramp, which goes over southbound Harbor Scenic Drive and Ocean Boulevard in this area, is being removed so construction can be completed for the new northbound connector ramp. Northbound Harbor Scenic Drive will remain open at all times. For the latest traffic updates and construction news, visit www.newgdbridge.com, or download the “LBBridge” app. The replacement project enables the Gerald Desmond Bridge to remain in use while the new bridge is under construction. 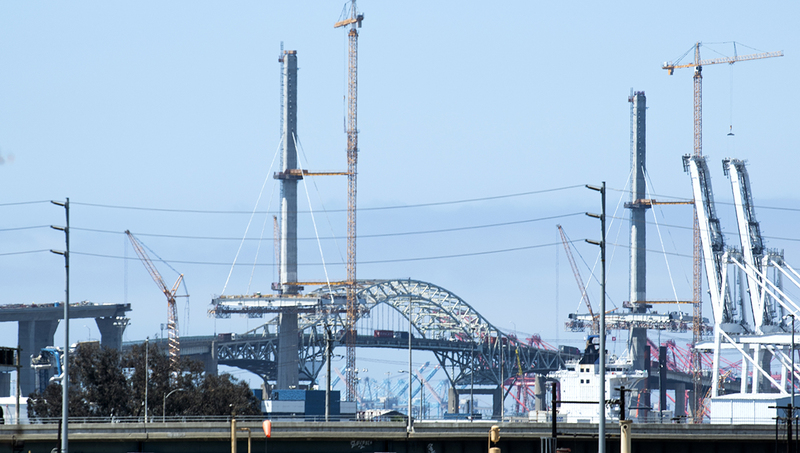 The $1.47 billion bridge project is a joint effort of Calrans and the Port of Long Beach, with additional funding support from the U.S. Department of Transportation and the Los Angeles County Metropolitan Transportation Authority (Metro).